Clare Schellenberg was appointed as associate pastor of Hope Mennonite Church in Winnipeg in early October 2016. 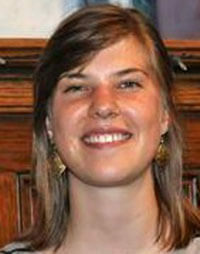 A graduate of Canadian Mennonite University, Winnipeg, she double-majored in biblical/theological studies as well as peace and conflict transformation studies. Previous to this appointment, she served as a youth sponsor at Hope Mennonite for two years. In the spring of 2015 she also completed a four-month pastoral internship at First Mennonite Church in Winnipeg, an experience that affirmed for her both personal and external callings to ministry. This will be her first official appointment to pastoral ministry, and her work will bring a strong focus on children’s and youth programs. Schellenberg has accepted this post with the support of her wife Kathleen; the two were married just last year.